Glenn Murray - £6.6m. 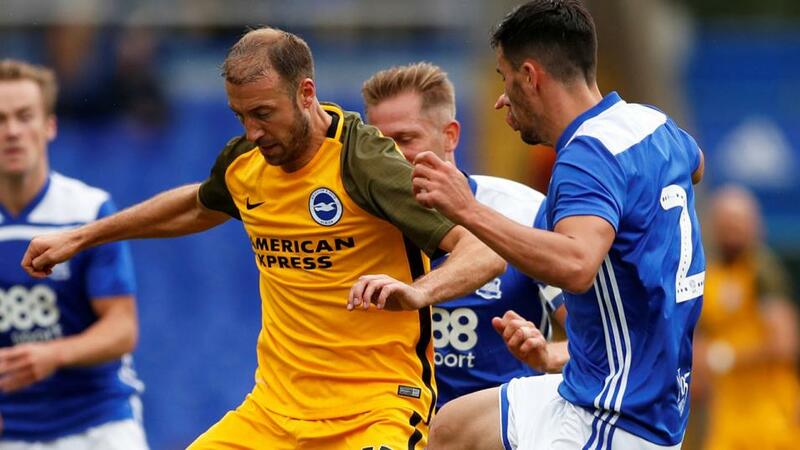 Only once this season has Glenn Murray not found the back of the net in front of his home fans. This is one though where you'll have to monitor the latest news closely following a head injury last weekend. The early signs are good but keep an eye out. If he plays then grabbing a goal wouldn't surprise anyone. Rúben Neves - £5.1m. In the same game, sometimes you just look around and feel that a player is due. After scoring and creating one in their opening day 2-2 draw with Everton, the 21 year-old Portuguese international has done naff all from a fantasy perspective. After six goals from outside the box last season, the odds are he'll be wheeling away in celebration again soon enough. Callum Wilson & Josh King - £6.5m & £6.4m. Last week I bigged them up and Bournemouth played out a dour 0-0 draw with Southampton. This week however they travel up to west London to face a Fulham team whose defence has more holes than Swiss cheese. If Cardiff can score four against them then you know they are in trouble. Plenty of goals in this one and the Cherries strikers are still dirt cheap. Xherdan Shaqiri - £7.0m. One of the most inconsistent and stress-inducing fantasy players around has made his way back on to my likes list this week. Liverpool have some injury concerns in midfield and his performance in the Champions League on Wednesday night earned rave reviews. If he starts against a lacklustre Cardiff defence at the weekend then he's a great priced fourth midfielder. Kiko Femenía - £4.2m. If you are ever in the need of finding a defender for next to nothing who might bring home a clean sheet bonus, find out who Huddersfield are playing. That is a nifty albeit long-winded motto for the 2018/19 FPL season. This week Watford are the recipients of that opportunity and you can get this guy at just £4.2m. Well worth a one-week rental. Ross Barkley - £5.7m. Last week I wrote about Barkley in this very spot and I think he deserves a second week as a big value play. He didn't start against Manchester United but did come off the bench to score the equaliser. His gander is up and Chelsea will need that extra quality that he brings to pick apart a tough Burnley back line. I like him to start and make a fantasy impact. Anthony Martial - £7.3m. No-one believes in the Manchester United attacker in the world of FPL. With only 2.6% of squads have selected him, that seems awfully low for a mid-priced player who has scored three and totted up an assist in his past two outings. His boss does like to switch it up but they've been much better recently with both him and Rashford starting. Grab him while he's hot. Alex McCarthy - £4.5m. Southampton haven't looked great at the back so far this season but a spirited clean sheet at the Vitality Stadium last weekend will give them a bit of confidence. Newcastle come into town this Saturday and they aren't exactly a Juggernaut when it comes to scoring goals. Potential cheap clean sheet points here. Trent Alexander-Arnold - £5.1m. Two Premier League games on the bench after a blistering start to the season has made me extremely concerned. I moved him out last week expecting a prolonged absence for whatever reason Klopp has decided. With 19.8% of squads having selected him, you may continue to be disappointed with no game time. Romelu Lukaku - £10.9m. No change from last week as the big-priced Manchester United man looks a pale intimation of himself at the moment. No value in splashing the cash on him despite the tempting Everton match-up. Spurs and Manchester City are facing off in what looks to be a mouthwatering encounter at Wembley on Monday night. Harry Kane and Sergio Aguero are both right up there for captain picks. Liverpool face Cardiff at home and that has points written all over it for the likes of Mo Salah, Roberto Firmino and Sadio Mané. Arsenal are playing well so their attackers are in play and an off the beaten path pick, Callum Wilson or Josh King. *Remember the deadline to submit your teams for GW10 is 11:30 on Saturday.